Barbie was my doll of choice when I was a little girl, blithely giving me a false impression of how my body would develop and a lifetime of insecurity. I’ve just discovered I got off lightly though, as were I ten years older I’d of had to contend with Growing Up Skipper. Skipper is commonly (well, in little girl circles) known as Barbie’s younger sister, and if you’re lucky you can have great fun making Barbie babysit her and generally act preachy and grown-uppy. 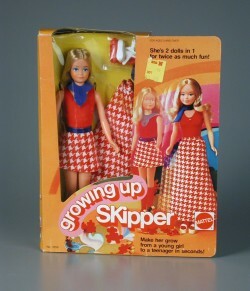 In 1975 Growing Up Skipper was released, a doll that would change the innocent face of Mattel forever, and give a whole new meaning to those awkward ‘I must, I must, I must increase my bust’ exercises. This is because when Skipper’s arm was rotated her torso would lengthen and breasts would appear on on her chest. Seriously. The idea was that this was the doll that would ‘mature with you’, and the marketing referred to her as being ‘Two Dolls in One, Twice as Much Fun!’.